I’m not usually a fan of vegan or vegetarian dishes that try to mimic meat dishes. But this is an exception. This I had to try! Over the years, I’ve noticed more and more posts of unripe jackfruit in recipes claiming it is just like pulled pork. I had to see for myself. It’s definitely grown in popularity that I now see that Trader Joe’s sells it! Having grown up with this fruit, it seems odd to me that this would make a good meat substitute. But then again I’m used to the ripe fruit hanging from the tree. The unripe canned stuff is ideal for a meat substitute because it really doesn’t have much of a flavor, and has a kind of chewy/tender mouthfeel. I can see how it might easily absorb flavors you add to it, like tofu. But whereas tofu is really crumbly, this holds together pretty well. 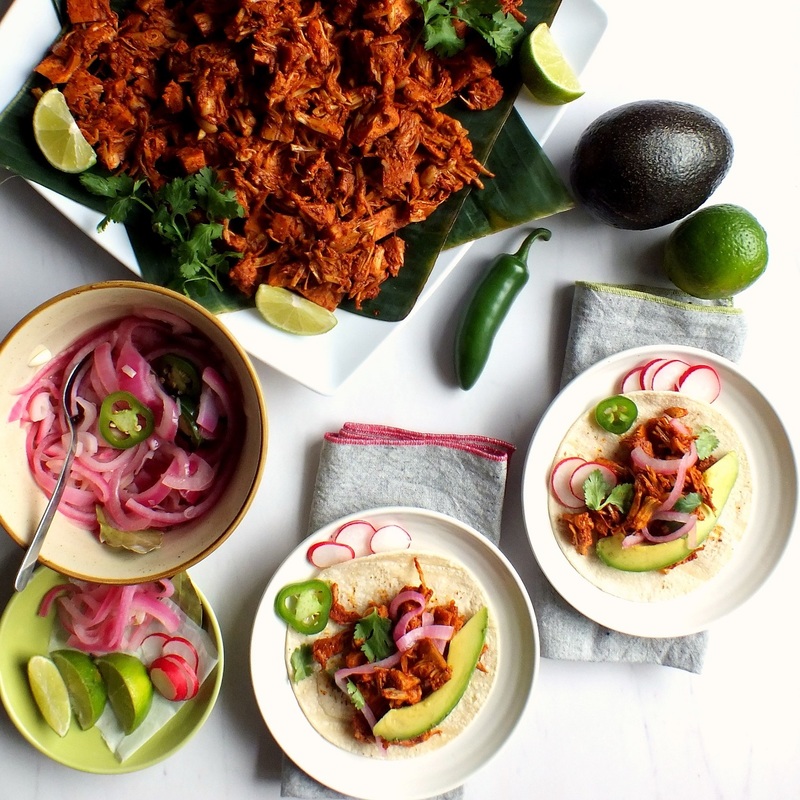 Cochinita Pibil is a traditional roasted pork dish from the Yucatan Peninsula of Mexico. The meat is marinated in a citrus and annatto colored paste with spices and slow-cooked wrapped in banana leaves in a pit in the earth. I decided to use this recipe HERE and to make tacos with it. So, now that I made it, what’s the verdict? I am going to give it a thumbs up, with some caveats. It is a very good believable meat substitute. The rumors are true. Just look at it. But it is not exactly the same as pulled pork. There is something…I don’t know what. Something is missing. It’s good, but the mouthfeel is slightly different. Maybe if you do not include the seeds or core area of the fruit. I noticed some recipes online say to include, some don’t. There also seems to be a quality in meat and pork that I’m not finding with this at all. But then again, maybe I’m just expecting too much. After all, I’m judging it strictly without the other components of the taco ingredients. So I’m going to say, use this as a substitute for a pork dish, but use it in something that has other components. Like pulled pork sandwiches with mayonnaise, coleslaw, pickles, buns, etc. Also, make sure you tell someone that it’s not meat. Trust me, they’ll know it’s not meat. That way, there’s less chance of disappointment! Maybe it’s umami that’s missing. I bought several cans of the stuff, because I still want to experiment with recipes, but I might try recipes that showcase its qualities without trying to make it resemble and taste like meat. I glanced at a few recipes online of soups containing coconut milk where the jackfruit flesh is cut in large chunks and you can see the seeds and fleshy parts, and it looks like that might be the way to go. Drain and cut the canned jackfruit. Cut from core to outer edges of fruit as in here. Zest the orange, and juice it. Should be about 1/3 cup of juice. Place both the zest and juice in a blender. To the blender, add the achiote paste, jalapenos, cumin, coriander, cinnamon, cloves, cilantro, garlic, lime juice. Puree to a paste, adding more orange juice if needed. In a large saucepan, heat up about 3 Tablespoons of olive oil, or other preferred vegetable oil, on high. When hot, add the cut up jackfruit, and sauté about 10 minutes, until tender. Remove from heat. 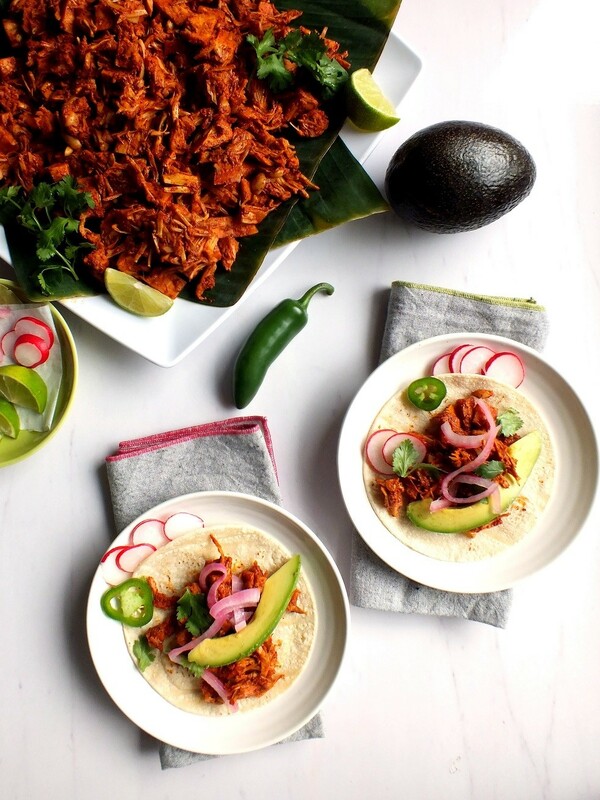 With two forks, while still in saucepan shred the jackfruit to resemble pulled pork. Add the contents of blender and mix to ensure all of the fruit is coated with the sauce. Add a couple of tablespoons of water, if sauce is too thick. Line a baking tray or dish with a high lid with foil and place banana leaves overlapping and hanging out the sides. Place the meat in center of dish, over the leaves and fold the overhanging banana leaves over the top. Bake for about 30 minutes on 350 degrees F. Remove from oven and open banana leaves and drizzle about 3 Tablespoons of maple or agave syrup (if using). Place back in oven with leaves open and bake another 20 minutes. This helps firm up the jackfruit to make it more like meat. Season with salt and pepper, to taste. Serve as tacos with hot corn tortillas topped with pickled red onions, cilantro, sliced radishes, jalapenos, and avocado. 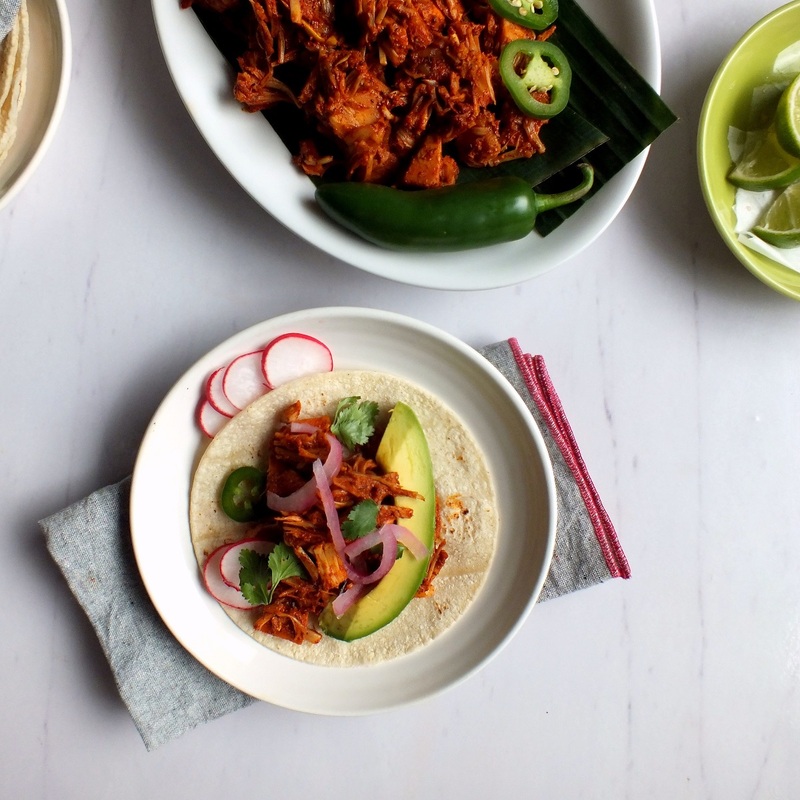 This entry was posted in baking, dinner, food blogging, mexican food, vegan and tagged cochinita pibil, jackfruit, vegan, vegan pulled pork, yucatan, yucatecan. Bookmark the permalink. Hello Dave, the title of the post caught my attention, as I was not aware that Jackfruit indeed is called as a meat substitute elsewhere too, and was interesting to go through your recipe. I too make a spicy curry or dry sabji of the raw Jackfruit and it sure is called as vegetarian mutton in my household, which fooled my son when he was very young, but now he simply avoids eating it, prefers real meat than the jackfruit 🙂 . I make it using the Indian spices and onion, tomatoes and some coconut too. I will try and make a post someday when I am lucky enough to see the raw jackfruit in supermarkets here. Thanks for your comments! I am really just starting to explore jackfruit, so it’s nice to get input from someone with experience with it. That curry dish with the tomatoes and coconut sounds really good, too!